“The truth will set you free?” Don’t be ridiculous, that’s only a dark notion from our distant past! In our modern, enlightened age, we know that questions of truth are unimportant, compared to whether that truth is offensive or not. Sounds outlandish? Crazy? Or maybe secretly deep down somewhere you like it, but think we just haven’t come that far yet? Well maybe not in America we haven’t, but we all know how Europe has always been much more enlightened and progressive than the backward, benighted United States. Prosecutors: Dutch anti-Islam politician can’t defend himself by arguing his comments are true. And no, this is not an Onion article. Frankly, I doubt those at the Onion have yet stooped to the particular degree of contempt for their fellow man that would be necessary to make things like this up. 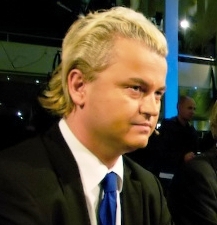 For those who do not know, there is a rather controversial politician in the Netherlands named Geert Wilders. He is the leader of the Netherlands’ Freedom Party, a new political party which has made shocking gains in the last few years based on its strong anti-immigrant, anti-Islamization stance. Geert Wilders, the controversial head of this party, is now on trial in the Netherlands, not because he actually committed some sort of crime, but because the opinions he has expressed on the subject of Islam and immigration have been deemed “offensive” to the Muslim community. For example, he has had the temerity to call Islam an inherently violent and totalitarian ideology, to equate the Koran to Mein Kampf, and to call for a cessation of Muslim immigration into the Netherlands. Wilders has argued that his views of Islam are supported by expert and academic analysis, and speaking the truth cannot be a crime. He says the charges against him are an attack on the freedom of speech. Oh, you can, can you? The verdict is expected to be handed down on Nov. 5th, but frankly I no longer hold much hope that the verdict will be in Wilders’ favor. If truth or freedom were still a consideration, then of course the verdict would be in Wilders’ favor … then again, if truth and freedom were still considerations, this trial would not even be taking place. If the only question left is whether or not Wilders’ statements are offensive to Muslims, then Wilders is certainly guilty. Of course, if Wilders had a jury, then he might get off anyway due to jury nullification. But as there are no jury trials in the Netherlands, I personally believe that the odds of Wilders being declared innocent in light of this recent development are now hovering only slightly above zero. If Wilders loses this trial, it will officially be the end of free speech in Europe. Even if I had not been certain of that before, the fact that questions of truth have now been explicitly barred from consideration have certainly solidified my opinion. I would tell the Europeans that it was time to get out their guns, as guns are the only thing left with which one can remedy a corrupt government once honest speech has been barred, but for most Europeans that solution is also no longer an option. So enjoy the Dark Age you have brought on yourselves, Europe, through your enlightened view that compassion is better than truth, mercy better than justice, and peaceful self-abnegation better than a potentially violent self-defense. My only remaining hope is that America manages to stop itself before it reaches your bleak destination. Canada is just about as bad, with their restrictions on speech that isn’t more or less approved by the government. No speech is free unless all speech is free, no matter how objectionable it might be to some. The only tolerable limits are when speech can directly harm others, and that has to be applied very carefully. The case of Geert Wilders really is a tragedy. Whether he’s right or wrong or whether a majority agrees or disagrees with him, he should have the right to speak without this kind of persecution. I keep watching Geert Wilders warn the world of what he fears is coming. Any human being should be allowed to voice his beliefs, and he speaks with concern for all humanity. Civilized nations should heed his words when he warns that Islam is once again on the march, and that its followers once again endanger the world. Their reaction would seem to validate his warning for they have threatened to take his life for speaking his conscience. Many of the people of his nation have chosen him as their representative because he speaks honestly of the things they fear. He is not being judged by honest men such as himself! Mister Wilders stands daily before a sham court proceeding that has restricted his ability to defend himself. They try him, not for a crime against society, but for speaking the truth in defense of his fellow man. I keep looking at this man…At his conviction, his loyalty, his wisdom and his courage, but I can no longer see him without thinking of Winston Churchill. The 21st century could use another Winston Churchill but he is on trial for telling the truth. Maybe that is the reason we need him so badly, for any world that prohibits the truth needs a hero. Mine is Geert Wilders. It seems as though things may be going well for Mr. Wilders. In a two-day long precise analysis of the remarks of Wilders, who had to stand trial for discrimination of Muslims and incitement to hatred, the prosecuting officers explained to the court that Wilders may have been insulting and provocative, but his words were within the limitations of Dutch law. This doesn’t mean that the trial has stopped — next week the defense will continue. The Dutch law system demands a full cycle of prosecution and defense, and will end with an extensive verdict. Though in theory the court could, it is clear that now it is almost impossible to convict Geert Wilders. I did see that, and I’m glad. I wrote this article kinda fast, mostly because I was so shocked by the headline. There have always been slander and libel laws, but traditionally in a free country, the truth should be the only defense you need, no matter what you’re saying. After all, it’s not a crime to shout “fire” in a crowded room if the building really is on fire. As for the new attitude of the prosecution, it is good in one sense and bad in another. The good thing is that he’s probably going to be acquitted. The bad thing is that the reason he’s probably going to be acquitted is because his comments have not been deemed offensive enough to warrant prosecution, and not over any question of whether or not they are true. -It isn’t compassion, it’s a misplaced sense of guilt. Western European countries have handled their immigration issues so badly that they are, indeed, in for a lot of trouble. I think they don’t even know right now how bad that trouble is. As much as it pains me to accept this, Canada has made the same horrible mistakes in handling its immigration policies. Montreal, the city where my family lives, will soon become unlivable because of this. The interesting thing is Americans are probably more welcoming to immigrants that most of Europe. Those who are concerned about border control and illegal immigration (including me) are often painted by the left as being “anti-immigrant,” but for the vast majority that isn’t true. What we want is effective federal control of the border and a well-managed system of legal immigration that’s in the best interest of the U.S.
-All that exists in Canada but the problems remain. Immigration doesn’t stop at the border. Unless there are programs that help people inscribe themsleves into society after they enter it, these problems are unavoidable. Yes, I remember all the government programs that were required to assimilate the masses of immigrants the US got around the turn of the 20th century. What a massive, bloated government bureaucracy it took to integrate those millions upon millions of immigrants into society. Sorry Clarissa, but I disagree completely. The best way to assimilate immigrants is to make them understand that if they don’t assimilate well enough to speak to potential employers and hold down a job, they will have a choice between going home and starving, and nobody will miss them if they choose the former. Clarissa, going to piggy-back on Brianna here. It isn’t up to the new nation to help people fit in – the desire to fit in on the part of the immigrant must be there and be very strong at the outset. You’ve put the cart before the horse. I don’t see anything wrong with reasonable government programs that help immigrants assimilate. Language training programs, for example, can be very useful provided they don’t go too far — e.g., mandating that schools teach in a foreign language beyond providing basic, supplementary training programs. American society is a good deal more complex and difficult to deal with than it was at the turn of the 20th Century, and even back then many immigrants were pretty much left to suffer in squalor in big city slums. The key, though, is that immigrants must want to assimilate, and that desire is missing among many recent immigrants, such as Mexicans (legal and illegal) marching with Mexican flags and ranting about taking over the U.S. Southwest and Muslims who, among other absurdities, want to supplant U.S. law with sharia law. For those people, I agree with Brianna — go home, and good riddance. I do. Naturalization should be a painful, onerous process to ensure that only those that really want to be here actually come here to stay. If people want to come here, fine. Have them prove their worthiness of this republic.